Sydney Lang, 16, of Edmonton, Alberta, seated center, poses with cast members from "Teen Wolf" during a meet-and-greet arranged by the Make-A-Wish Foundation on day two of Comic-Con International on Friday, July 21, 2017, in San Diego. Pictured from front row left, Colton Haynes, Shelley Hennig, Charlie Carver, Tyler Posey and Khylin Rhambo, and from back row left are Cody Christian, Linden Ashby, Melissa Ponzio, and Dylan Sprayberry. The stars of "Teen Wolf" made a special appearance at Comic-Con Friday for an audience of one. Nine members of the MTV show's cast sat down for a meet-and-greet with 16-year-old super fan Sydney Lang, who came to Comic-Con with her family thanks to the Make-A-Wish Foundation. Sydney's parents, Kevin and Gwen, said it was their first family vacation together. The couple owns a small business that they closed for the first time in 26 years to come to the pop-culture convention with their daughter, who has Hodgkin's Lymphoma. Soft-spoken Sydney beamed and blushed as she walked into a room where Tyler Posey, Colton Haynes and other stars were chanting her name. 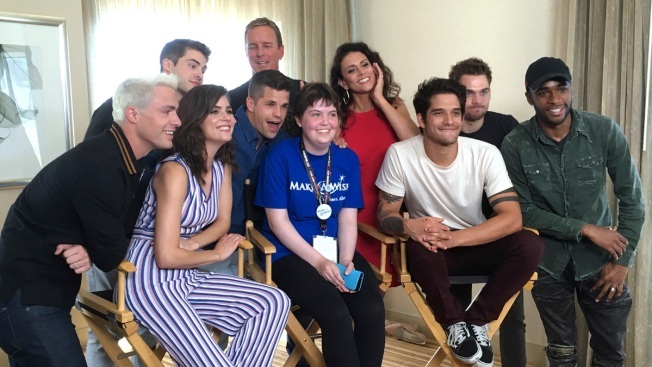 The teenager's wish was to come to Comic-Con and attend the "Teen Wolf" panel, which she did on Thursday. Friday's meeting with the cast was a special surprise. She sat at a table with Posey, Haynes, Linden Ashby, Shelley Henning, Khylin Rhambo, Dylan Sprayberry, Charlie Carver, Cody Christian and Melissa Ponzio. They chatted with Sydney about her favorite characters and episodes and asked her about her life back home in Edmonton, Canada. Henning playfully inquired whether Sydney had any personal connections to Prime Minister Justin Trudeau and might make an introduction. Besides their "Teen Wolf" experience, the family planned to attend panels for such shows as "The Big Bang Theory" and "Doctor Who." Kevin Lang said they've been on the move morning to night and having a blast. "They exceeded our expectations in the first half of the first day," Lang said of the Make-A-Wish crew. Sydney, meanwhile, was speechless. Her face-spanning smile said it all.